Rookie Odell Beckham Jr. was a big part of Sunday’s come from behind win. The first half of Sunday’s home between the New York Giants and Atlanta Falcons looked much like the Big Blue disaster that were weeks one and two. The defensive line was bulldozed, resulting in no pressure on quarterback Matt Ryan and the Atlanta running game big chunks of yardage at a time. The offense was ineffective, but the Giants only found themselves down 13-10 at halftime and mounted a second half comeback for a 30-20 win. After the Falcons’ second possession it didn’t seem the Giants would be extending their two game winning streak. What appeared to be a harmless screen pass almost turned into a back breaker. From their own 26-yard line, Ryan went into a deep drop and connected with running back Antone Smith at the line of scrimmage. Giants’ safety Antrel Rolle missed a bad angle tackle and there was no one there to back him up. The speedy Smith outraced Dominique Rogers-Cromartie, who had initially stopped pursuit on the play, to the end zone for a 74-yard touchdown and a 20-10 Falcons lead. Then the Giants defense stepped up their game. They only sacked Ryan once on the day, but continually got in his face and/or flushed him out of the pocket. A quick three and out by the Falcons, gave the Giants the ball back with 24 seconds left in the third quarter. Now it was time for the Giants offensive line to do some bullying, giving Manning time to throw and opening holes for Williams, who took over as the featured back when Rashad Jennings sprained his knee. Manning and Beckham hooked up on a 14-yard completion and Cruz pulled in a 12-yard pass on a third and eight. Facing a third and three at the Falcons’ 15, Beckham outmuscled Robert Alford and got in front of the cornerback in the end zone for his career TD reception. A second straight three and out led to a Josh Brown 50-yard FG to give the Giants a 27-20 lead. The Giants iced the victory after a questionable decision by Atlanta head coach Mike Smith. The Falcons faced fourth and one on their own 29-yard line with 4:48 remaining in regulation, all three timeouts remaining, plus the 2-minute warning. But instead of punting, Smith showed no faith in his defense, which in fairness had been dominated in the second half, and went for it. The decision backfired when Giants’ defensive tackle Jonathan Hankins dropped Ryan for a nine yard loss. With 2:11 remaining in the game, Brown booted througha 26-yard FG for the game’s final scoring play. Ryan was missing 2/5 of his starting offensive line, but it didn’t seem to matter through the first 30 minutes of the game. Trailing 7-0 after a first quarter TD pass from Eli Manning and Randle, the Falcons drove 80 yards in nine plays that culminated with running back Stephen Jackson practically walking into the end zone for a game tying 10 yard touchdown. The drive, which took 4:43, featured 22- , 11-, and 12-yard completions from Ryan to receiver Julio Jones. Each time, Jones was wide open. Stephen Jackson also reeled off an 11-yard run before he scored his second touchdown of the season. Atlanta got the ball back immediately when return man Preston Parker was stripped of the football on the ensuing kickoff. 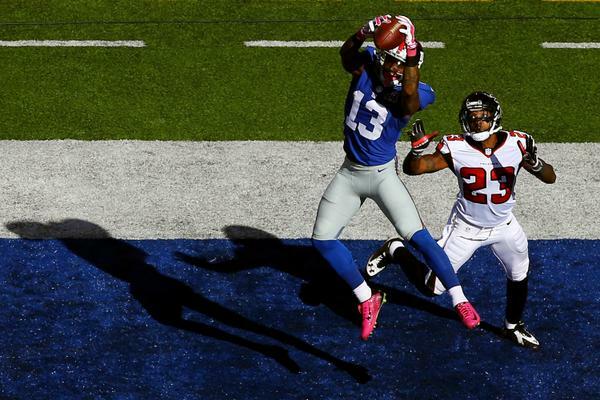 The Falcons’ Eric Weems recovered the pigskin on the Giants 21-yard line. The six-play drive crossed into the second quarter and ended with a Matt Bryant 22-yard field goal for a 10-7 Atlanta lead. The Giants went three plays and out and the Falcons had the ball back yet again in less than two minutes. This time the Giants defense stopped the Falcons after they marched 37 yards to the Giants 38 yard line. 21 yards rushing by Jennings and an 18 yard completion to Randle helped the Giants get to the Falcons’ 34, but on second and nine, former teammate Osi Umenyiora sacked Manning for a seven-yard loss. The Giants eventually settled for a Brown 49-yard FG. Upon getting the ball back, the Falcons quickly moved 73 yards as Ryan completed six straight passes. But with 2nd and goal at the two, Ryan’s passes to Jones and Roddy White fell short. The Giants were fortunate to escape the first half down 13-10 after Bryant nailed a chip shot from 20 yards. The Giants rookies came up big and will have to continue to in the coming weeks with Philadelphia and Dallas next on the schedule. Williams finished the game with 65 yards on 20 carries and two receptions for 18 yards. Beckham wasn’t on the field for a large number of snaps, but there appears to be a solid comfort level between he and Manning despite missing the pre-season and the first four regular season games with an injured hamstring. He was targeted five times and finished with four receptions for 44 yards. With a lingering foot injury keeping middle linebacker Jon Beason out of the lineup, six-year veteran Jameel McClain also turned in a strong game. The 29-year old free agent signee – after six season with the Baltimore Ravens – recorded seven tackles and defended two passes.